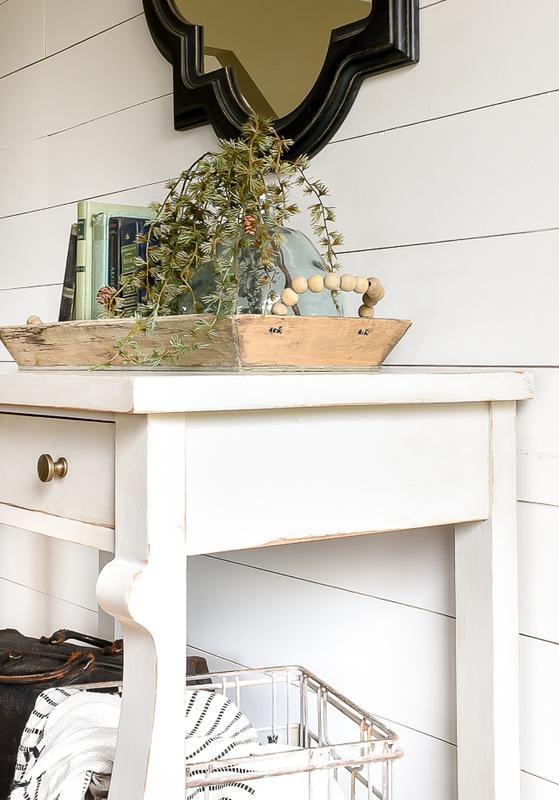 An antique console table gets a fresh new makeover with General Finishes Seagull Gray milk paint and dark antique wax. 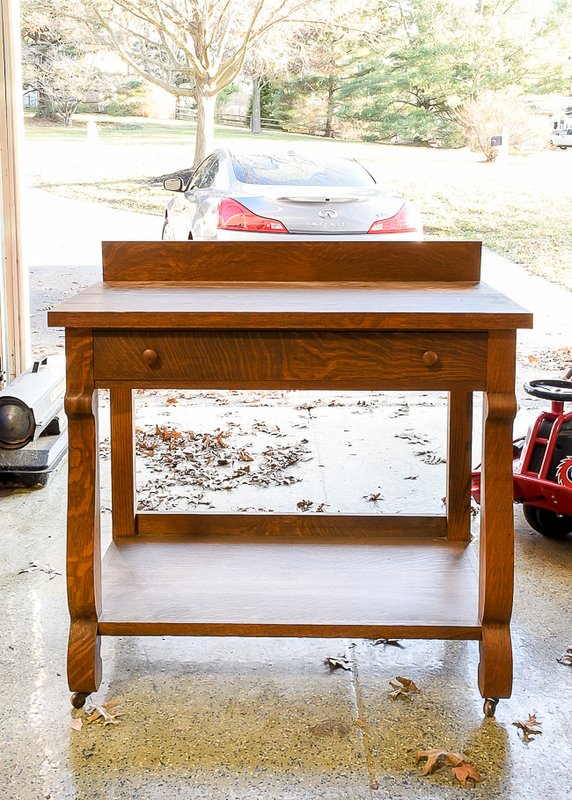 Last year, I shared my top 10 sources for scoring great affordable used furniture. One of the places I mentioned was local auctions and that's exactly where I spotted this antique console table. It was sitting outside, the top veneer was warped and peeling off, but I could immediately see the potential. It had great curves and old stem cast iron wheels that I couldn't resist. 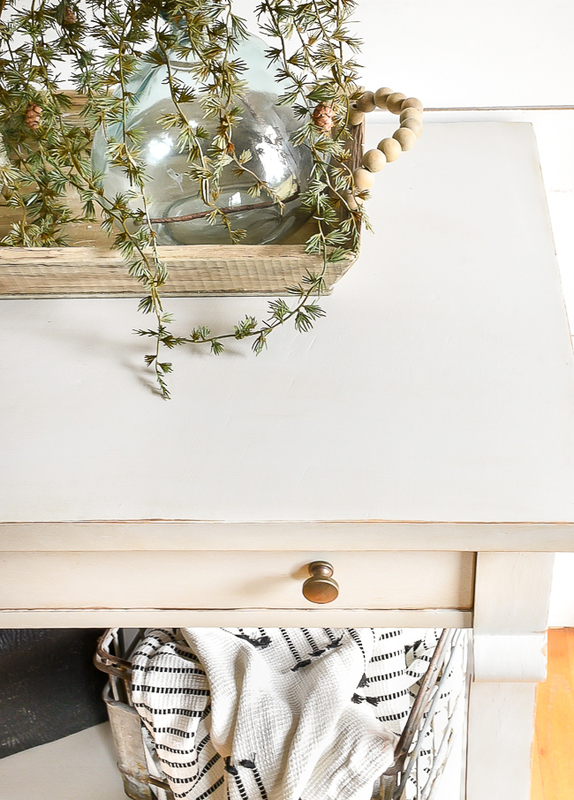 I knew a little Seagull Gray milk paint and gold hardware would give this dated and damaged console table the update it needed. Lucky for me, no one else saw the potential and I was able to get it for a steal. 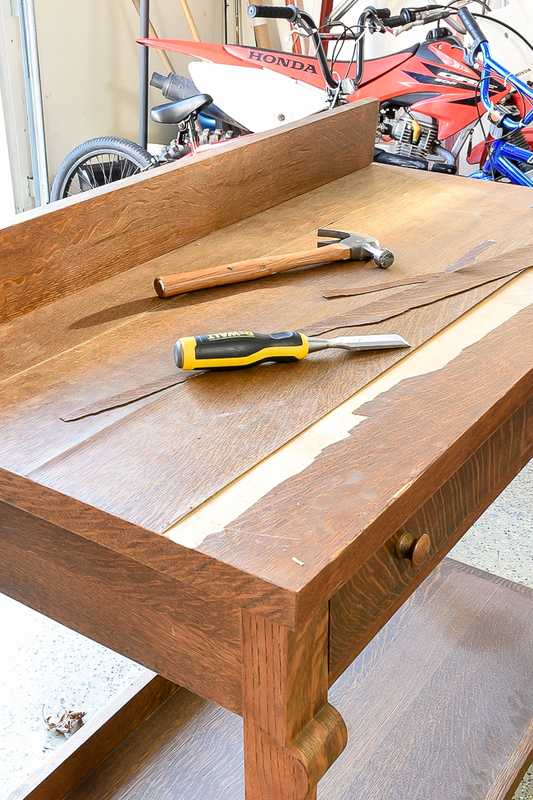 It's hard to tell in the before picture, but there was some definite damage to the veneer on the top of the table. It was so bad that I could literally peel off the veneer in large long strips. I've dealt with removing stubborn veneer in the past and thankfully, this was a much easier job. 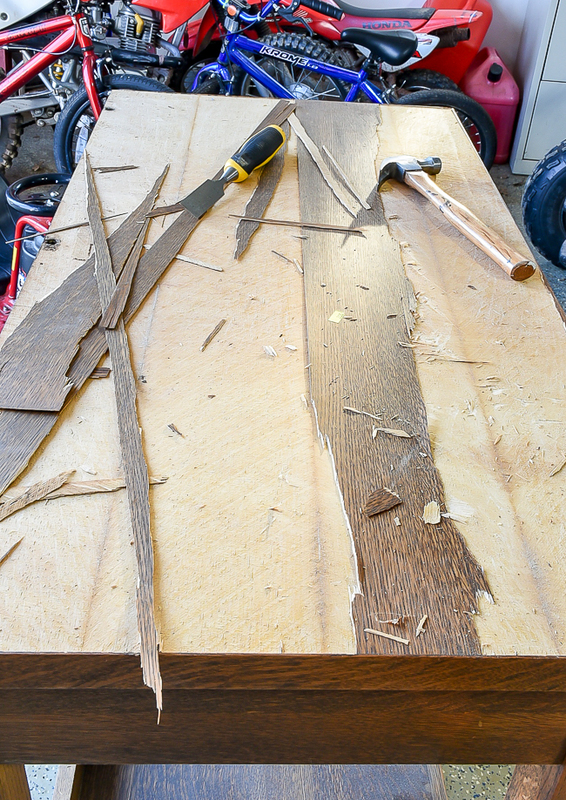 There were a few areas where I had to use a sharp chisel and hammer to get under and lift up the veneer, but overall, it was super easy to remove. After the damaged veneer was removed, I filled the holes (from the back plate) and damaged areas with my favorite Minwax wood filler. I've mentioned this wood filler in the past and it's definitely my favorite. It dries rock hard and super fast, which is awesome for impatient people like me. After the wood filler was dry, I sanded the top smooth then gave the rest of the table a good sanding. I then wiped it clean before applying two coats of General Finishes Seagull gray milk paint. I let the paint dry then sanded the edges for a naturally distressed look. I originally thought I was just going to use clear wax but decided the addition of dark wax would better suit the curves and style of the table. I used Annie Sloan soft clear wax and Amy Howard dark antique wax because that's what I had on hand. Any brand of clear and dark wax will do though. You also want to make sure you have a brush and lint-free cloth on hand. 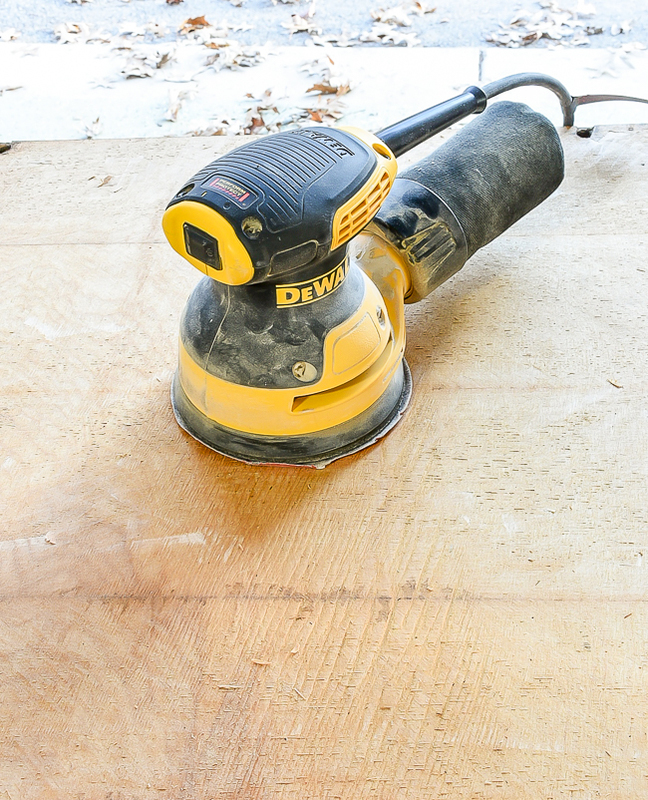 Apply a layer of clear wax to the entire piece using a wax brush. 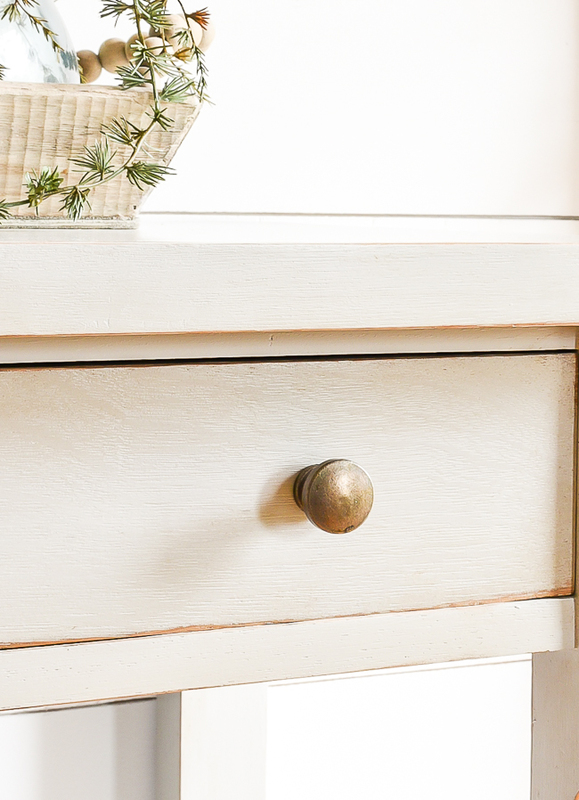 Having a layer of clear wax on your furniture first is important in being able to control the dark wax later. 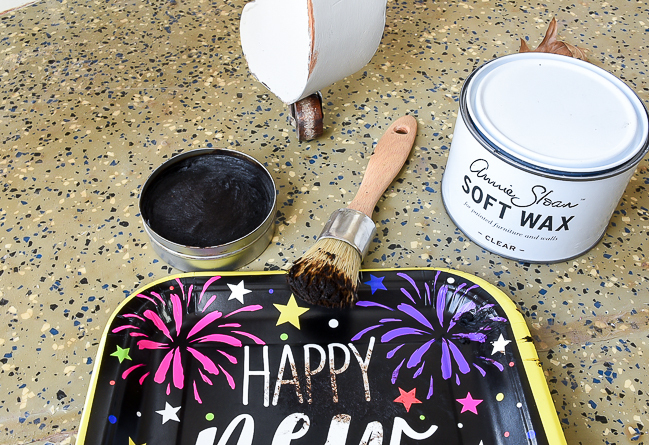 You can add a scoop of dark wax to a paper plate or simply use it out of the container like I did. Either way, dab your wax brush into the dark wax, blot off the excess then apply it to the edges and detailed areas of the furniture. 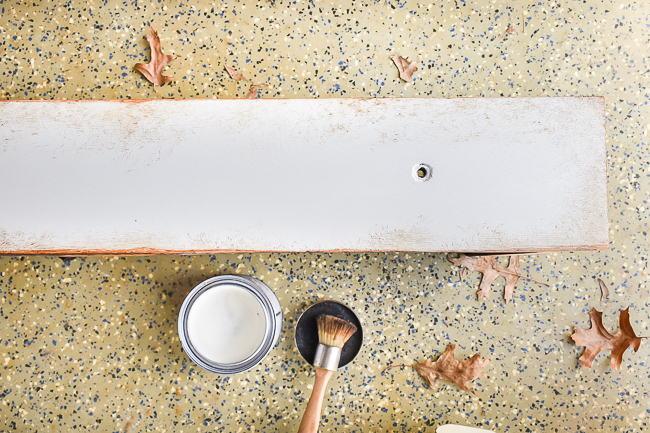 Using a lint-free rag (or triple zero steel wool), blend the dark wax into edges and groves. This allows details to pop and gives depth to your piece. 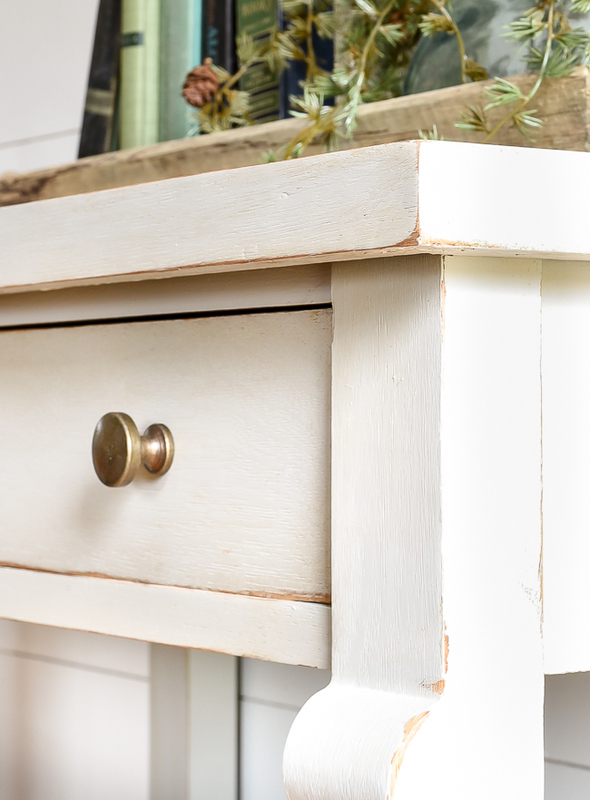 With very little wax on your brush, lightly go over the entire piece of furniture with dark wax then blend with a rag or 000 steel wool. 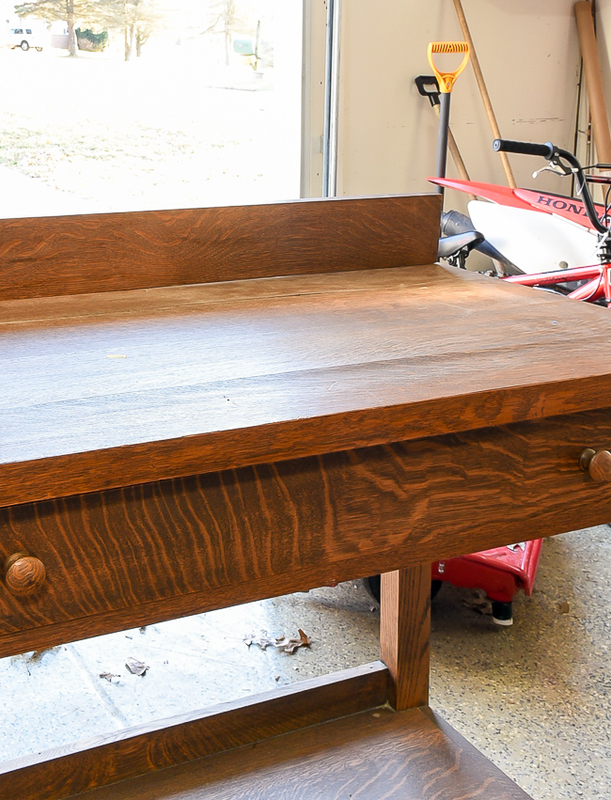 I applied very little dark wax to my table, but you can apply as little or a much as you like. 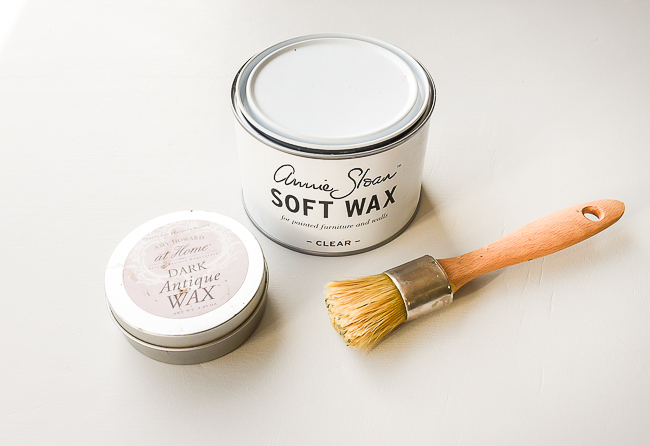 *** TIP***If you end up applying too much dark wax you can "erase" the dark wax by going over it with clear wax. I'm not sure why, but the pictures don't really show much of the dark wax, but I promise it's there. It's definetely subtle, but gives the console table a little depth and age. I'm a big fan of gray and brass, so I also swapped out the original hardware for brass knobs that I picked up from Hobby Lobby for 50% off. 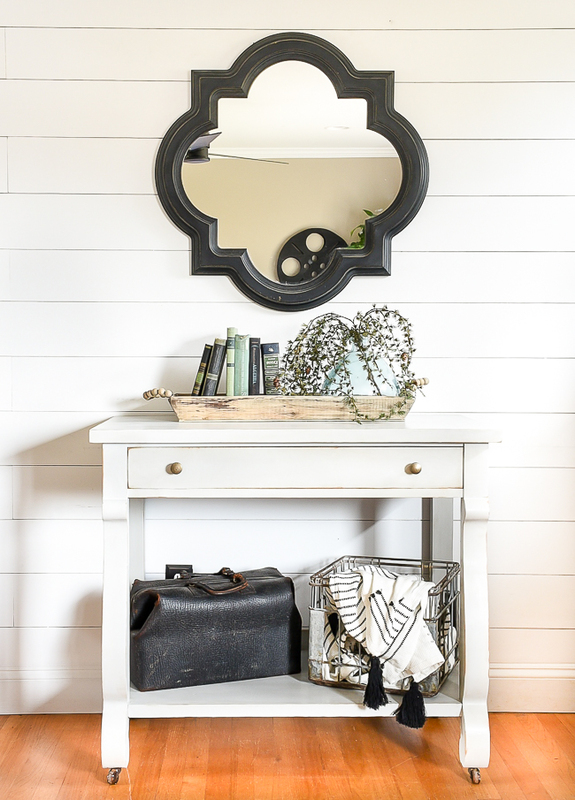 The light gray paint and dark antique wax accents now beautifully match the curves and character of this great console table. 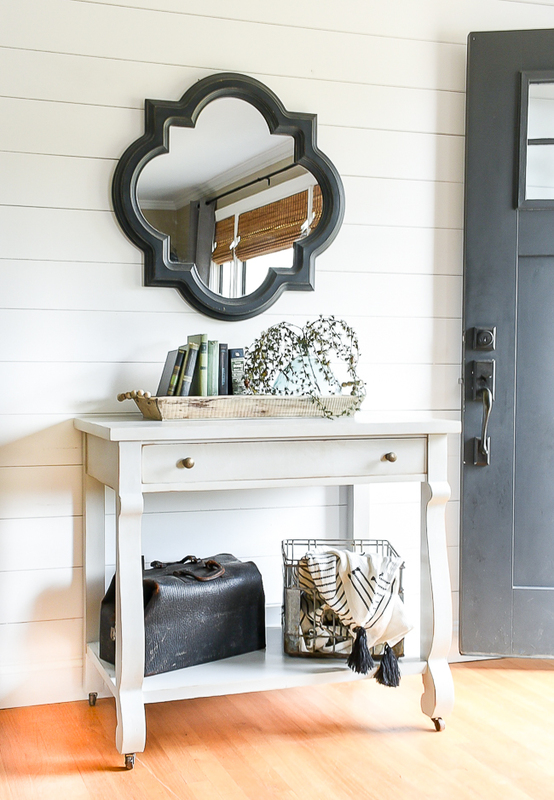 Wouldn't it be perfect for an entryway or TV stand? 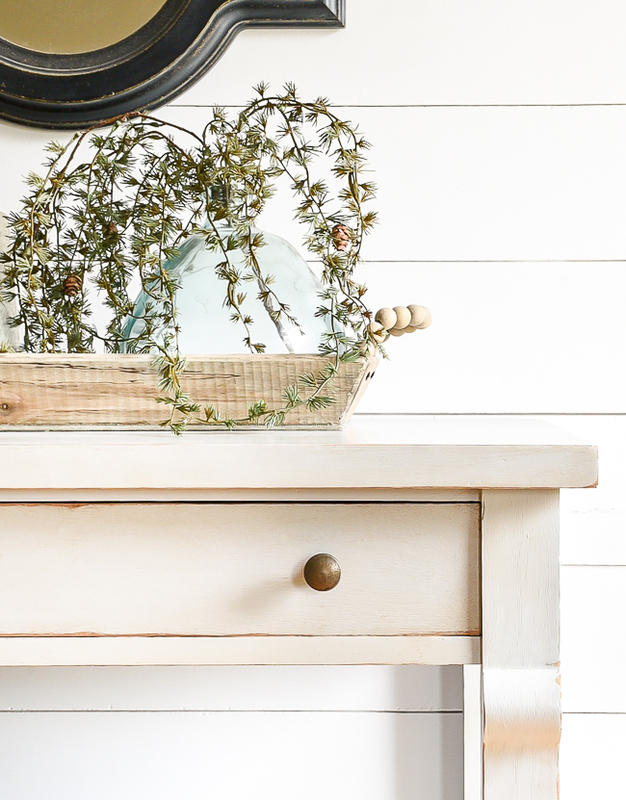 Your made-over console table looks really nice. It's a familiar design to me as I have a buffet with the same curved legs and the same two drawers across the top. My buffet has a mirror across the back of the top with some supports with the same curve as the legs and a narrow shelf at the very top. It was my grandmother's and I really treasure it. 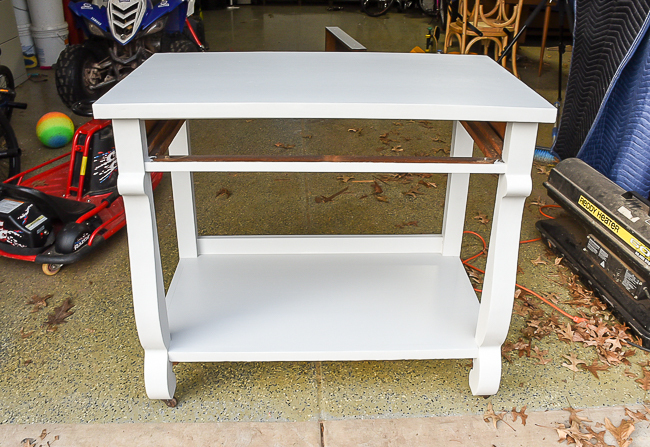 I think it would look good with the same treatment you gae the console table but I will probably never paint it because it wouldn't look like "Grandma's buffet" then. Question: Couldn't you just have painted it w/o removing the veneer. I have the exact same piece! Been thinking about painting it. 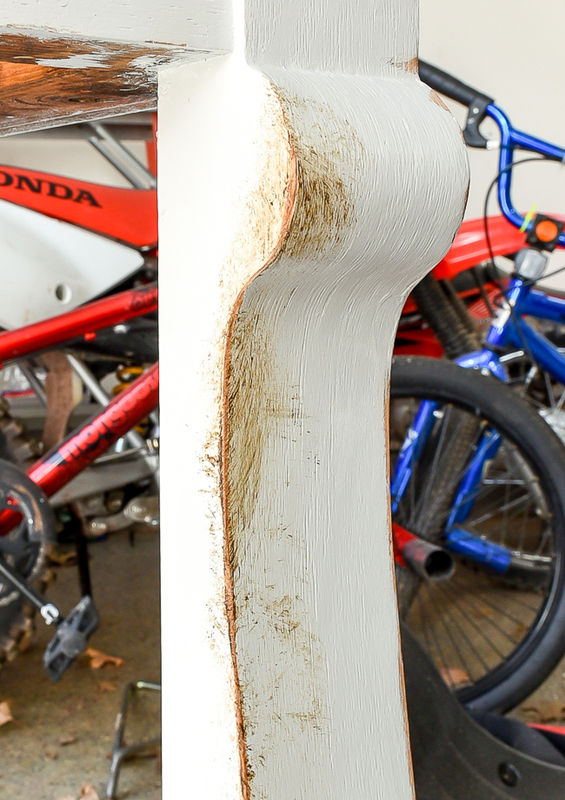 Yes, you can certainly paint over veneer as long as it's in good shape. Just sand and scuff it up a little before painting. I had to remove the veneer on this piece because it was warped and peeling and was not in good shape.